I'd like to start a chain topic by asking all the members of this blog to post the flag of their country where-ever they may see it. I would like to start with my country, the Sultanate of Oman. The picture is of when Oman was close to winning the 18th Gulf Cup but took 2nd place instead. 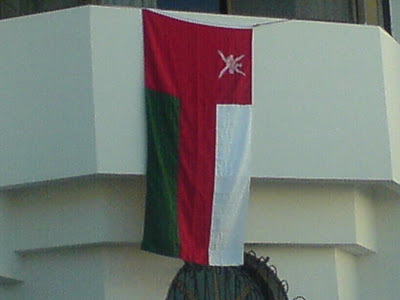 This is the Omani flag that I had flung on our house to show support of our country during that time. We had a beautiful sunny day yesterday and was shocked to see this view when I woke up this morning.